Circle business card printing is the perfect way to present your corporate identity, helping your brand to stand out while maintaining a classic feel. The 2.5” circle is just the right size to present round logos and corporate seals. The round shape is also durable, preventing premature creasing typical of business cards with sharp corners. Choose between 3 coating options for the front and back of your cards to give a nice contrast and create a more dynamic look. Circle business cards are just the thing to round out your corporate stationery, regardless of the size of your business. Order as few as 25 - a good quantity for freelancers -or as many as 100,000 -perfect for a large sales team- in a single order. 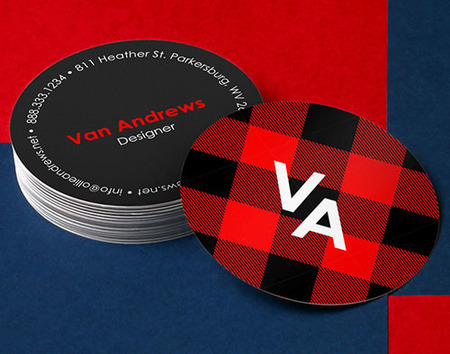 To learn more about die-cut circle business cards give our print experts a call. Circle business cards are an easy way to get attention for your brand. While nearly every entrepreneur has a business card, only a select few have circular cards, ensuring your brand is easier to remember than your competitors’. They’re a great match with common circular logos. Round business cards are printed on thick 14 pt. stock, as well as heavier premium 16 pt. stock. Both choices offer excellent weight and feel, helping recipients create positive associations with your brand. Circle business cards are a good choice for small creative agencies, startups, and other small businesses that want to make an. The option to order large quantities also make circular cards a good choice for larger businesses with big sales teams. Circle business card printing is a durable, creative way to get your brand out there, with just the right amount of sophistication.